The life and significance of Léonie Martin, the "sister of St. Thérèse of Lisieux. Léonie was a special child: frequently sick; abused by the maidservant; expelled from school; misunderstood by her family. She entered religious life three times before, at age 34, she entered the Monastery of the Visitation at Caen in northern France in 1899 for good. As Sister Françoise-Thérèse, she lived there until she died in 1941. As a laywoman, Léonie lived at the margins of her society. She found Christ there and found him in her own woundedness. Although she experienced heart-rending misunderstanding and isolation, she received the grace to love those around her and to trust God to the point of folly. She was the first disciple of Thérèse's "way of confidence and love," For at least half a century, many people have prayed to Léonie , especially parents of special children and children in trouble, families in conflict, and persons who, like her, struggle to find and fulfill their vocations. Countless people write to the nuns of Léonie's monastery to report favors received through her intercession and to ask the nuns to join them in praying that Léonie will obtain for them from God the graces they need. Many pilgrims come to pray at her tomb: some to ask her intercession, others to give thanks for favors received. Léonie's beatification is being considered, and Mgr Jean-Claude Boulanger, the bishop of the diocese of Bayeux-Lisieux where Léonie lived most of her life and died, has granted the imprimatur for a prayer that Léonie might be declared venerable (that is, declared to have practiced heroic virtue, the first big step toward sainthood). Léonie invites the wounded, the broken, and those who find no place in the world to realize that the traumas of the past and the bitterness of not being understood need not come between us and God's "consuming and transforming love." Learn about her life; read the stories of her influence; and invite her to accompany you along the way of confidence and love. January 22, 2017: Leonie's body is transferred to its new shrine in the Visitation chapel. August 27, 2016: The crypt which houses Leonie's tomb is reopened to visitors. July 2, 2015: The solemn opening of the cause for Leonie's beatification and canonization in the chapel of the Visitation Monastery at Caen! Léonie Martin, the sister of St. Thérèse of Lisieux, was born June 3, 1863. She became Sister Françoise-Thérèse of the Monastery of the Visitation at Caen (northwestern France). Léonie led a challenging life: ill from childhood; abused by a maidservant; expelled from school; isolated within her family. 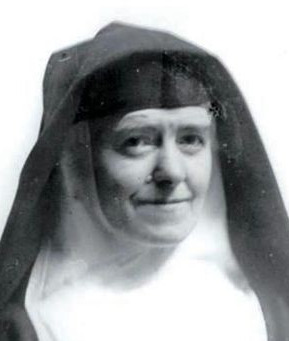 She tried religious life three times before she succeeded: in 1899, at the age of 35, she entered definitively the Monastery of the Visitation at Caen, where she died in 1941 at the age of 78. How did the troubled child and unhappy teenager turn into the sister everyone remembered as so kind, so serene, and so happy that they could not believe she had had a difficult childhood? As a laywoman, Léonie lived at the margins of her family and her society. She found Christ there and made him the center and the source of her life. She discovered God within herself, in her woundedness, and she became the first and best disciple of Thérèse's "way of confidence and love." When she found a home at the Visitation, she wrote: "I am very happy--as happy as it is possible to be on this earth. When I look back on my past, as far back as my earliest childhood, and compare that time with this, I am overwhelmed with gratitude to the Heart of Jesus, who has enveloped me in so much love, and who has placed me in this loveliest anteroom of heaven, where I shall live and die." After her death, Léonie was almost forgotten. But the people discovered her, and, about 1960, the nuns of her monastery began to receive letters from all over the world asking them to pray that Léonie might obtain graces from God for those who wrote. Some of these letters came from the parents of special children, from families in conflict, and from persons who, like Léonie, struggle to find and to fulfill their vocations. These letters were followed by letters of thanksgiving. Pilgrims come to the monastery pray at her tomb in the crypt, to ask for graces and to give thanks. Now she is being considered for beatification. Mgr Jean-Claude Boulanger, bishop of Bayeux-Lisieux, the diocese where Léonie lived most of her life and where she died, has granted the imprimatur for a prayer asking that Léonie might be declared "venerable" (that is, declared to have practiced heroic virtue). The only happiness on earth is to apply oneself in always finding delightful the lot Jesus is giving us. Your lot is so beautiful, dear little sister; if you want to be a saint, this will be easy for you, since, at the bottom of your heart, the world is nothing to you. You can, then, like us [like her three Carmelite sisters], occupy yourself with 'the one thing necessary;' that is to say, while you give yourself up devotedly to exterior works, your purpose is simple: to please Jesus, to unite yourself more intimately with Him. Invite Léonie to accompany you and to lead you to surrender yourself, as she did, to God's "consuming and transforming love." She will lead you to our true home: the Heart of Jesus.